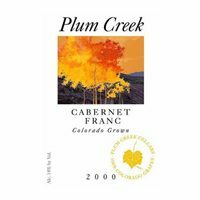 Founded in 1984, Plum Creek Cellars was among the pioneers producing fine wines exclusively from grapes grown in Colorado. As a mark of our early venture, Plum Creek holds Colorado winery license No. 10, the oldest of all of the state’s wineries continuously license. We recognize the importance of site, climate, soil, drainage and other factors crucial to grape production in a high-altitude climate. With 55 acres of vineyards planted in the state’s premier fruit-growing areas – Palisade and Paonia – Plum Creek focuses on growing grapes in the areas best suited for each variety. Grapes are harvested by hand, row by row, as optimum ripeness and maturity are reached. Winemaker Jenne Baldwin-Eaton creates exceptional wines which are rich in flavor and which offer complexity, depth and finesse. Recognizing the quality of Plum Creek wines, judges in international, national and regional competitions have awarded more than 400 medals. Relax and enjoy the wide variety of Plum Creek wines in the tasting room, on the cool, covered patio or at the picnic area. A warm, inviting atmosphere greets tasting room visitors who can sample European-style wines amid antique furniture, Oriental rugs and fine art. Winery tours are available (by appointment for large groups). Look for the metal sculpture, “Chardonnay Chicken,” at the entrance of the winery. Plum Creek Winery is one of Colorado’s oldest, most award-winning wineries. Among the pioneers of Colorado-grown wines. Specializing in Chardonnay, Merlot, Riesling, Cabernet Sauvignon, Riesling Special Reserve and more. From I-70, south at exit 42 - Palisade 1 mile, then west 1/2 mile.